On Monday, Sept. 24, The Oklahoman newspaper hosted a gubernatorial debate at the Oklahoma City Museum of Art. Three candidates are seeking the office, but only two were invited to the debate. Libertarian Chris Powell was excluded from the debate. Powell said he was excluded because he had insufficient support, suggesting that Powell wouldn’t be competitive with Democrat Drew Edmondson and Republican Kevin Stitt. 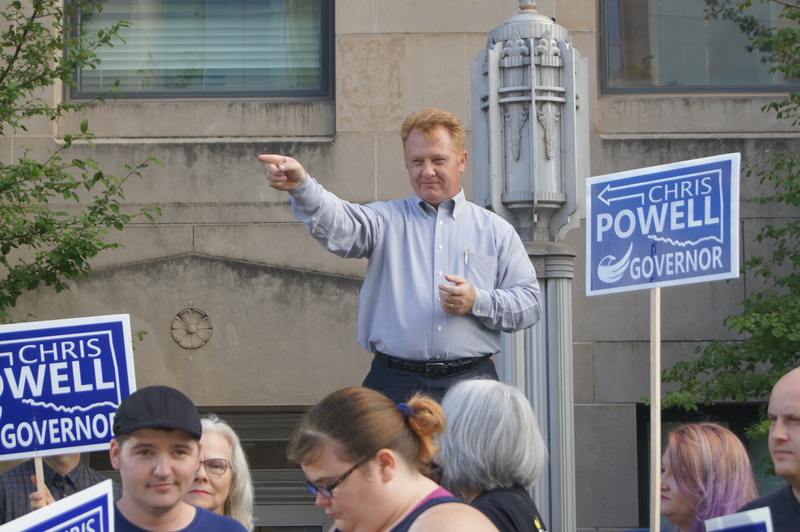 In response to the snub, Powell and the Oklahoma Libertarian Party arranged a rally outside the newspaper debate, calling for unbiased media coverage. The crowd of 21 people belted out chants of “On the ballot, on the stage,” with some supporters suggesting exclusion from the debate makes it harder for their candidates to garner the level of support needed to be competitive. “It’s hard to poll well in polls you’re not included in,” said Erin Adams, Chairperson of the Oklahoma Libertarian Party. Standing on top of an old, red newspaper stand emblazoned on either side with The Oklahoman’s logo, Powell railed against his exclusion. Powell said representatives from The Oklahoman ignored the rally. Powell said his campaign would only participate in debates and forums run by “credible organizations,” and stressed participation on an equal footing with the other candidates as a key factor. The campaigns for Powell, Stitt, and Edmondson have each confirmed their participation in an upcoming debate. The event will be held in Tulsa on Oct. 23, and is being run by The Oklahoma Academy, a non-profit policy group.